Café. Waiting. Love. is the second novel by author Giddens Ko to be adapted into a movie, after the wildly popular You Are The Apple Of My Eye in 2011. Despite so, Chiang Chin Lin, Director of Café. Waiting. Love. (who was also involved in You Are The Apple Of My Eye as an Executive Director) takes it in his stride. 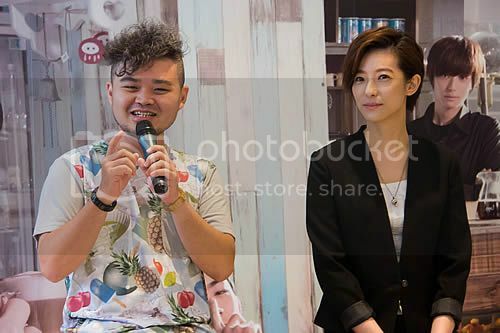 Speaking of his first movie outing, and if he is afraid of living in the shadow of Giddens Ko, Chiang said, "The anticipation was good for me. Giddens was heavily involved in this film, being the original author, scriptwriter and producer. He was also present during the filming process. However, he trusted me with his story, gave me much freedom for creativity in the storytelling, and did not interfere in the filmmaking." The director and cast (Megan Lai, Vivian Sung and Bruce) of Café. Waiting. Love. came to Singapore as part of their international promotional tour, after visiting Hong Kong and Malaysia. In the film, Megan Lai plays Abusi (Albus), the enigmatic barista working at the café with the same name as the movie. 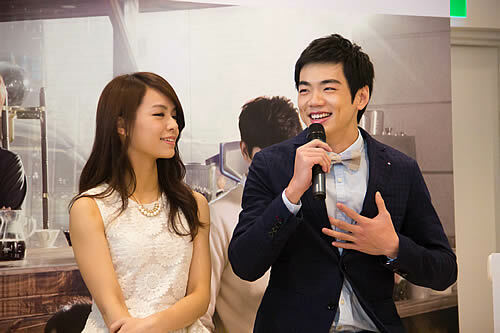 Vivian Sung is the female protagonist, Li Siying, a college freshman, while A-Tuo (Bruce) is her kind-hearted and good-natured college senior and suitor. For the leads Sung and Bruce, this is their first time acting in a movie, let alone playing the main leads. According to Sung, during the production process, the director allowed them to act out their characters, before making minor adjustments along the way. Being surrounded by more experienced actors and actresses also allowed them to learn on the job. Bruce says, "They (the more experienced co-stars) did not put on any airs, and there was no distance between us and them at all. At first, we were intimidated as they were already huge stars. We were excited, but didn?t dare to speak to them first. On the contrary, they would approach us first. All of them were very humble and serious, which allowed us to learn a lot from them." Speaking about himself, Bruce admits that at the start, he was not confident of his own performance. "However, the director was helpful and encouraging, while Megan (Lai) would remind us the different ways that we can present a particular scene." "When we were casting Abusi, we avoided female stars who already had short hair, as we wanted the character to be a surprise," says Chiang. "When Megan's name was mentioned, I went to Google her past images to see how she would look like in short hair. 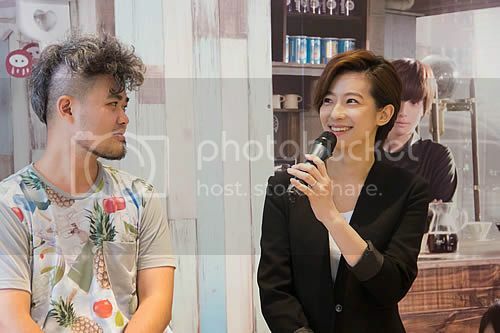 While I already thought that she would look handsome, what she actually looked like was different from what I imagined"
However, cutting her long hair was not Lai's main worry. She says, "Abusi is a character which the readers had the most expectations for, and she was a major talking point. I was afraid that I would not be able to live up to the expectations of a suave Abusi after cutting my hair. If I were not handsome enough, the audience would be disappointed, and I would be cutting my hair for naught." In comparison, Sung and Bruce admit that their roles were more similar to them in reality. "Siying is a college student, like myself, and this allows me to understand and express the role better," says Sung. "Also, I would be the type of girl who likes guys like Zeyu (played by Taiwanese newcomer Marucs C), who are handsome and manly, while being silent and mysterious. However, people I end up dating would be more like A-Tuo, who allows me to be myself." Bruce also draws parallels to A-Tuo, as the both of them would be game to do crazy and ridiculous things. In the movie, A-Tuo continuously loses bets and is made to wear a bikini while rollerblading and walking a cabbage around campus. While in real life, his challenges might not be as ridiculous, Bruce said that when he is surrounded by guys most of the time (he was in the basketball team since primary school), things can get pretty crazy. "When I was in secondary school, the showers would not have water when the swimming pool was being filled up. Hence, my friends and I would run across the school field, naked save for a towel, to the pool to shower, filling the swimming pool with soap." Readers of the novel might be disappointed that not all of the crazy things A-Tuo does in the novel might be included in the film. Despite so, Chiang urges moviegoers to enjoy the movie as it is. "While the novel was special as it details the two main leads meeting new people and going on adventures, the movie has its own pace, and we only have around two hours in the theatre. In this two hours, we tried to condense the uniqueness of the novel without losing what made it special." Also, in the movie, we were trying to bring across the message that everyone is waiting for their special someone. The characters in the movie all hold different views about love, and deals with love differently. We put in a lot of effort to show this, and hope that right from the start, the audience would be able to laugh with the characters, while empathising with them in the end. Our review of CAFE. WAITING. LOVE right here.